demonstration on the effectiveness of fog on Class A fires. Gilbert Spencer and Tom Doherty remember this 1945 demonstration very well. As fifth graders at Mt. Carmel School, Gil and Tom were returning to school following their lunch hour at home (until the 1960s, Mt. Carmel school kids could go home for lunch). As the two ambled north along the Whitney Avenue sidwalk toward school, they were startled to see a New Haven Fire Department ladder truck drive right past them, then turn into Ives Street. "What the . . !" Tom Doherty was the son of Hamden career fire officer, Lieutenant Everett Doherty. Gil Spencer's father, R.K. Spencer, was a prominent member of the Mt. Carmel Volunteer Fire Co. It would have been unthinkable for the younger Doherty and Spencer, two future Hamden battalion chiefs themselves, not to investigate the presence of a New Haven ladder truck on Ives Street. And so they did. The New Haven Fire Department, in cooperation with the Rockwood Sprinkler Company, was conducting a demonstration on the effectiveness of fog application in heavy Class A fire situations. 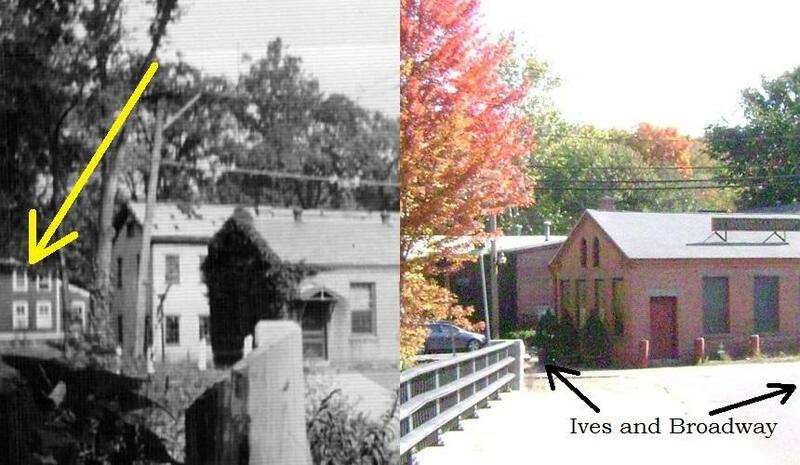 Hamden provided a small vacant 2-1/2 story house that stood on the south side of Ives Street between Broadway and Spruce Bank Road, right behind the old Woodruff factory (see then-and-now photo below). According to the 1937 Hamden City Directory, the house was once occupied by Walter H. Beach. 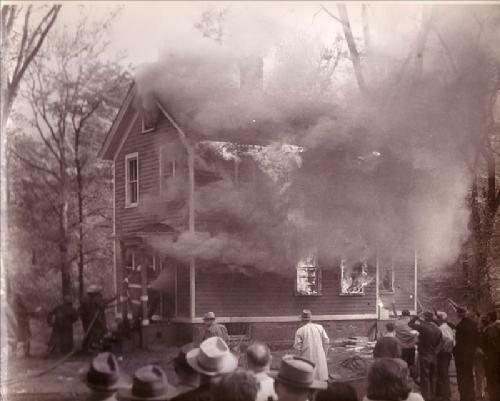 Fire officials from all over the region attended the demonstration, the results of which were published in Fire Engineering later that year and again in 1948 (see below). The demonstration consisted of five separate burns involving both interior and exterior attacks. Hamden pumpers drafted from nearby Mill River to protect exposures and to supply the ladder pipe of New Haven's Truck 3, a 65' straight-frame aerial ladder truck assigned to Station 10 on Lombard Street. As fifth graders Gil Spencer and Tom Doherty made their way down Ives Street toward the excitement they were joined by several more of their classmates, all of them transfixed by the spectacle of flames leaping from the windows and licking at the ancient clapboards. In an era when living room console radios and Saturday movie matinees provided virtually all youthful entertainment, this amazing and completely impromptu live firefighting demonstration was an exciting diversion for all the kids. It also made them lose track of time. An unexpected spectator joined the crowd. Mt. Carmel School principal Miss Elvira Holm - think of Miss Gulch, also an "Elvira" - abruptly ended the magic and wonder of the occasion when Gil and Tom caught sight of her among the scores of other spectators. Unfortunately, Miss Holm also caught sight of them. Described by Gil as a stern disciplinarian, Principal Holm "suggested" that he, Tom and the rest of the Mt. Carmel kids "get right back to school." So ended the fire demonstration for the kiddies. 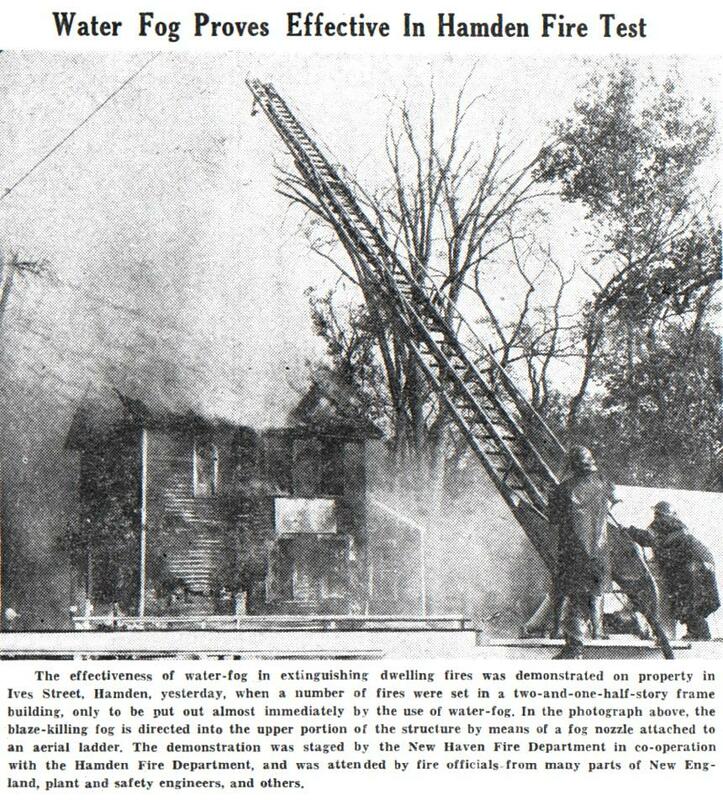 Read more about this interesting and unique collaboration between the Hamden and New Haven Fire Departments in the June 1948 Fire Engineering article reprint below (courtesy of Chan Brainard). CLICK on the article below to enlarge it slightly for easier reading. 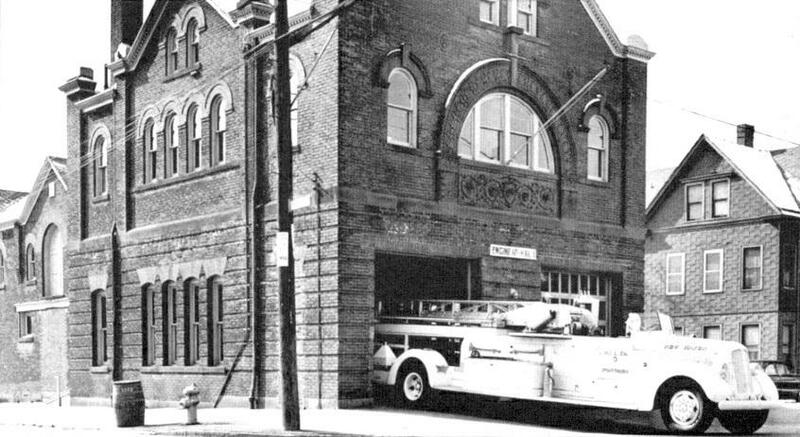 New Haven's Truck 3, a 65' straight-frame aeriaL, at the old Lombard Street fire station.